Seller: Frozen Ape Pte. Ltd.
© Frozen Ape Pte. Ltd.
And then a glitch started. When pressing the tempo up or down button and holding it shifts the tempo by 10’s, how wet randomly it will glitch out and increase or decrease tempo to maximum or minimum and any adjustment of tempo takes you to max or min. Only way to reset the glitch is to restart the app. This was on my iPhone 6 and now the same bug on my iPhone XS. I emailed support a long time ago and still have not heard back. I loved this app but now it is literally unusable in a professional setting. I use this metronome daily. Perfect for my every need both while giving drum lessons and playing professionally! The title says it all. I don’t use one feature that might be useful for professional groups — the possibility of assigning a name to a particular selection of time signature and tempo, thereby having one tap selection of tempo among a group of tempos to be used in a single performance. The vibration mode does not work with IPhone 8, from 109 bpm and up the IPhone vibrates only in the 1 and in the 3. With my iPhone 7 was working smothly. PLEASE FIX. I used to love this app. Now, after wasting much time to change the configuration, I give up. Why is a time like 6/8 only permitted to be set with dotted quarter, triplets or 2 eighths. I am searching for something where it is I who decides not the programmer!! Easy to use. Never glitches. My favorite. It also works as a tuner in a pinch. I've tried many metronome apps on my smart phone, and this one is by far the best. I use this all the time live and in the practice room. I recommend it to all my serious students. I love the odd time signature feature and the set list; it makes it easy to program my sets. Get this app! As a drummer, I have been using Frozen Ape Tempo apps in some capacity for years now. The Tempo Advance app is great, and I loved always having it on my phone but I didn't use it live. Once this version came along, the streamlined UI and easy set list features really captured me and I've totally replaced my Tama Rhythm Watch live. I prefer this over the Advanced version, because in a live setting I like having less to accidentally mess up. You really don't ever need a standalone metronome ever again and not in a "I can live with this since it's so convenient" kind of way--this product is actually much better than physical metronomes that cost up to 140 dollars. Great app overall, but there are a few bugs. One is the tap doesn’t really seem to work anymore (though in previous versions it did), and another is it sometimes freezes in rapid tempo advance when your trying to advance by 10 (by holding the tempo up button down) Otherwise, I use this app a lot! This app is amazing. I recommend it to all! I’ve been using Tempo for several years and have been very satisfied with it. It’s extremely flexible and has been 100% reliable. I recommend it. Unsteady time, used to love. I’ve used this app for years with no problems but for the last three months or so there’s been an issue where the metronome will slow down for a beat, or drop a beat. And no, I’m not talking about the coaching mode where the silent beat is a feature. I still use it when my physical metronome is missing but it’s so frustrating to have this great app squandered. This is superb and is the best I have used. The vibration function kills and is helpful. No bugs and easy to operate. You can tell that the developers use this app themselves, or at least work very closely with users. It’s easy to do the sorts of things you need to do all the time, like changing the beat or increasing the tempo or changing the accents on the beats. It’s intuitive to use and does everything I would want a metronome to do. Good, simple metronome to always have with you. As a drummer, I like a more complex unit for practice, but for the money and convenience, you can hardly go wrong with this purchase! Easy to get to all the options. It’s my go-to for practice. It worked great for the past couple of months but recently there are glitches every two or three minutes. I use this app during our chamber music practice and the unexpected pauses, albeit small, cause a lot of problems. Please fix it!!!! And just what I was missing - my teacher said the audience will forgive a note, but not being off key... just what I needed!! Best metronome app out there in my opinion. It has so many cool features! Def worth getting the pro version! There is no better etronome app! Awesome to use for piano and guitar e.t.c. My piano teacher told me to use it. It’s great. 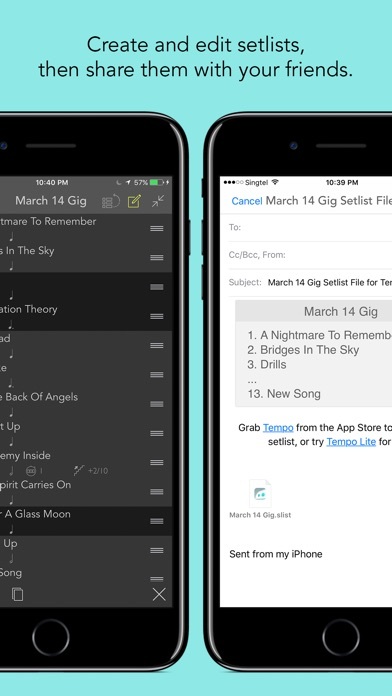 Everything is pretty straight forward, and the app allows you to create set lists and make changes on the fly. There are plenty of options for using different sounds for the beats and accents and whatnot. In addition, it is easy to share the set lists between devices! Very useful for us at the church, enabling us to use whatever devices are available at the time. The only issue I’ve got with the app is that the interface makes almost no sense when trying to “save changes” to a song. You have to click the + symbol and then overwrite the current song. Once you figure it out, it’s not a problem; but it can definitely throw you off at first. Overall, I am very pleased with this app and would highly recommend it to anyone looking for a versatile metronome app! This is the best metronome app for 84 reasons. A.) I find it to be easier to use than competitors. I also like the Pro Metronome app but it’s harder for me to set up a Setlist because of scrolling and eyesight issues, in that particular app. W.) It’s worth the couple dollars if you seriously give a crap about subjective reviews and have wasted your tempo on reading this entire review good grief reader person. This app does it all, better than the rest. The next step, for me, would be lock screen controls. What I was hoping was a programmable PLAYING setlist, like a Dr. Beat. I was also disappointed to have to bend around to get 5/8 time, which I use often. If those could be fixed or added, it would make this perfect. Otherwise it wasn't worth two dollars :/ TO ME at least Update 3/16/18: I had to uninstall this because I opened it on my watch once yesterday and it ate up SIXTY NINE PERCENT of battery life in BACKGROUND ACTIVITY. What?!? That’s insane and TOTALLY unusable. I’ll be looking for different apps now. Honestly - no complaints except on MY OWN INTERNAL CLOCK lol. Just buy the app - you won’t regret it. What’s a couple bucks - but this instead of your next cheap beer at a gig. Plus the app makers are always updating and making improvements. As a piano teacher, I teach students to demystify rhythmic groupings in the two hands played against each other from the simple, 2 against 3 (I want-a-hug) or 3 against 4 (pass the-bread and butter), to the complex (finding the least common divisor, then using the metronome for that long group and fitting the 2 different patterns together slowly). The technology of this app is way beyond what would be required to put two different groups against each other (each at a different timbre). I would gladly give up having a fuchsia background with birds and monkeys for one more real tool! It’s a great metronome app, you can save certain tempos and time signatures and everything. Really easy to use. One thing I would love though, is if we could use the play/pause buttons on our phones to stop and start the metronome. I use my headphones a lot to practice with my metronome and I’m constantly accidentally pressing the play/pause button on my headphones, and having my music blasting randomly in my ears with the metronome still going. So if there’s a way you could do that, that would be awesome! I use it for practicing rudiments. No complaints here. I started using it more than my favorite DB-90, enough said! This metronome works well as a standard metronome; it has many common features for practicing. I also use it for my gigs that require accurate tempi; you can store multiple presets within the app. The user interface is also very appealing. I use this all the time for practicing guitar, not just for steady pace for chord changes, picking, etc but just as an approximate measure count when just trying to get repetition. With both the guitar & horn it's also a great help to get objective feedback on my ability to speed up the pace with a passage as I get better. Another neat trick that I'll need another for (my wife's) I will start 2 metronomes at once to get a better feel for how, for example, eighth notes & triplets sound together - helpful when another orchestra section is playing something different. Using this app also increases my ability to use my ear for my surrounding while playing, to better play with others during rehearsals or performances. Finally, this has many options, & for an amateur like me it's perfect. My ability to listen and play to what I hear, i think essential for anyone who wants to play with others, absolutely improves with this. I’ve downloaded and purchased most metronomes on iOS, this is the standard. Other apps may have a niche use but for 99 out of 100 uses, I turn to this Tempo. As a owner of the classic stand alone metronomes (dr. Beat, beatlab, rhythm watch) they all collect dust now. This is the metronome I have recommended to my students for years. Ease of use, functionality and price set Tempo, as I said, as the standard bearer. I’ve been using this for years now. It’s loaded with great features. I have a music studio with over 300 students every week and this is the metronome of choice. I am head to toes in love with TEMPO! (the app) Yours forever, Michael. I teach drum lessons and have referred this to many students. Quick and easy adjustments of time signature and accent/non-accent rhythmic figures makes this a must. I have not done too much with the polyrhythmic section but the little that I have checked out it really a major bonus. This app is highly recommended..
As a percussionist and former music teacher, I tried out every metronome app I could find on the App Store. This one is far and away the best. Gig mode alone is enough to put it above most. Customize meters, accent patterns, save setlists, tap tempo, etc. 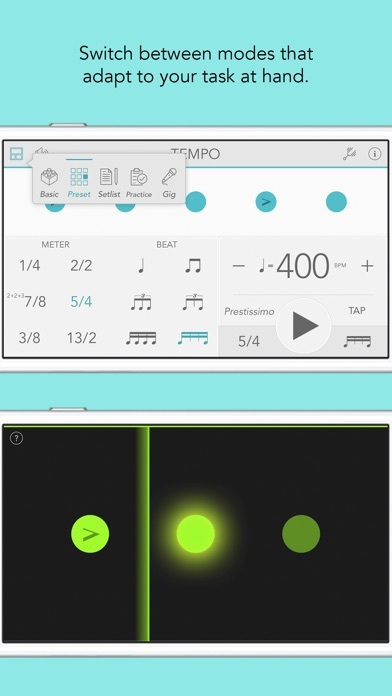 - it's the most full-featured metronome app out there. I also love that it now has a watch app and that I can switch songs in a setlist using the phone’s proximity sensor. The only things I'd like to see change would be to add .1 bpm increments and to allow Bluetooth syncing between devices so the whole band can listen to a synchronized click. 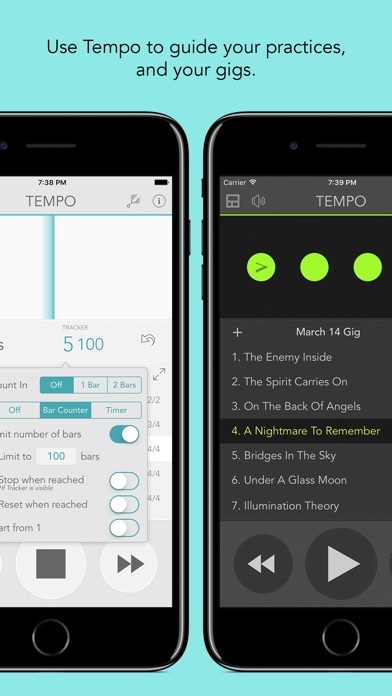 It’s a great, reliable, and resourceful tempo app! I have never had a problem with it! It’s also simple and can choose to get more advanced if wanted! Works amazingly! Does all you need! Great app! All it needs is an option for sound/tapping to come only from the Apple Watch! Nice job keep it up! I use it for practicing as well as private teaching. and i would honestly prefer this over a Korg, especially when in odd time signatures. doesn’t even compare to the other metronome apps. You need it. Get it now. Don’t ever practice without one! App doesn’t save panning upon restart. Mission critical bug. Always works well and have never had it freeze. Gave it 4 stars because I would love some drum sounds instead of just the normal beeping sounds. Great for gigs with set list view. Thanks for the regular updates! Said vibration mode, no vibration. Excited for the day when the app can be programmed to automatically do tile signature and tempo changes. This is one of my favorite metronomes. It’s so useful for my piano practicing and definitely recommended. This has saved me (a percussionist, ensemble leader, and music enthusiast—whatever that means) a countless number of times! Be it “I need to know the tempo in 5/7” or be it “I am way too slow, what was that tempo again?”... amazing. Must have! Please bring back classic blue theme! My only issue in the update is the loss of the classic blue theme! Other than that it’s my favorite one and only metronome app, and I’ve tried most of them. But please bring back the classic blue theme! Great app, very consistent, pretty straightforward to use! This app used to be awesome. The something happened with either an iOS update, or a App update. There is a bug where when you have the panning panned all the way to one side and the app restarts, the panning resets back to center without telling you. It still says that it is panned hard left or right, but it comes out dead center. Which really hurt me big time today...my metronome came blasting through the house in the middle of church, because of this bug. Have tried multiple iPads, all with the same result. PLEASE PLEASE fix this awful bug. I am looking for a new metronome app. Thank you, thank you, thank you!!! A very favorite app. An ideal balance of simplicity of controls with depth of features. I use Tempo whenever I practice. It’s robust enough to offer the variety of settings I need but simple enough to quickly switch from one cadence to another. Sound quality is good and it runs smooth on my iPhone 6. Great app, lots of options for practicing and creating set lists. Since I updated every now and then while changing tempos it will uncontrollably go all the way up to 400 or all the way down to 10. Please fix this! I used to love this metronome app. Unfortunately, I recently noticed it is running in the background and drinking significant amounts of battery. I have not run the metronome since Wednesday yet it is claiming 13 hrs of background activity in the past 24 hours, or 28% of my total battery usage. I need a metronome app, but not if it's going to behave like this one does now! FEATURE REQUEST: Add an option to the watch app to use haptic pulse for beat instead of sound on iPhone. 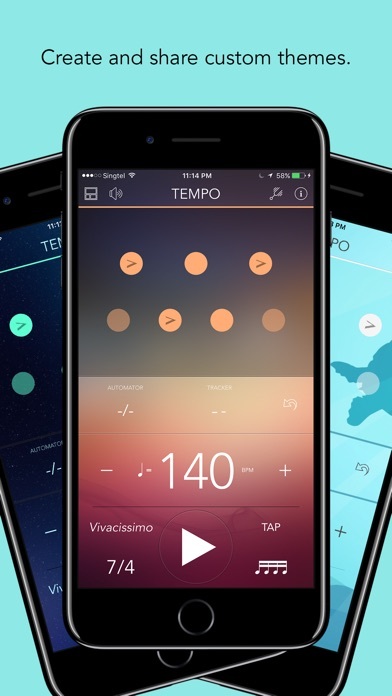 There are many apps out there, so if all you need is a basic metronome, take your pick. This adds the extra features key to any gigging musician; most notably the ability to not only store preset song tempos, but arrange them into set lists. Add to that things like the ability to manually tap the tempo to set it, ability to change the visual features of the timekeeper, multiple time signatures to choose from, etc., it’s a solid app. One star off for intuitive interface: You have to get used to how to get around the app to do things, but once you tinker around, you’ll get the hang of it. If the Apple Watch version had the time tracker feature that the iPhone version has, and did haptics when the watch was on silent mode, it would get 5 stars. It's been great using this but something I've realized is every time I switch to triplets the bpm kicks off what gives? Bought this app years ago for live gigs. Very useful app. Even has a set list option so that you can put a set list in it with the corresponding tempos. Also has an incorporated tuning fork in the app which is good for those last minute “tune ups” should you need it. UPDATE! Tap tempo does not work for iPhone 7 with current app version. Please fix it soon. Tap tempo still works perfectly on my iPad 2. A nice app! I'm a big fan of the bar counting feature. I use it every day for my practice. What I would like to see is more control over the dynamic levels of the beats. The current setup, normal, loud and mute, get the job done, but I'd really like to see just one more volume level. Another met app of mine features 4 volume levels for the beats and I just like it that way. A good app all around. Set list feature seems to function well. I’m the drummer in a band that tends to start songs off tempo at times. I was searching Amazon for a device designed for drummers in live performance when I read in a review that there were better apps for iOS than any of the hardware units. 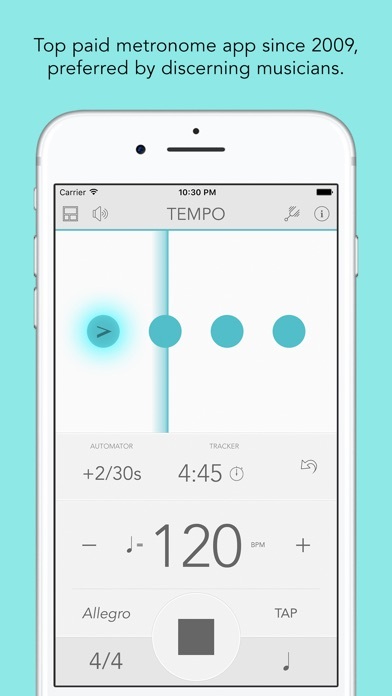 Tempo came up when I checked the App Store, and based on the reviews I bought the full version. After spending some time getting comfortable with the interface I was able to setup a full 3 set performance list that flashes the first 10 bars of the selected song at the correct tempo to get us started. It then advances to the next song and waits for me to start it when I am ready. It is simple to use and easy to see. This is exactly what I was looking for. It’s the best $2.99 I have ever spent. Highly recommended! Love Tempo. With iOS 11 on my iPhone 6, however, it’s been pausing and getting off-beat pretty constantly (once every other song or so). Could certainly be my phone, but hoping an update will fix the bug cause I love this app! I’ve used this app for years. It’s part of my gigging rig. One request - any chance we can get haptic tempo on the Apple Watch? Go to metronome with advanced features and reliable operation. Never had an issue. Just as the title says. I really like this app, but if you need to use signatures such as 6/8 I don't know what the heck their version of it is. Today I noticed Tempo was listed on top of the battery usage list - 9.4hrs background activity and 45% total batter usage in the past 24hrs! Hope developers will address this issue. This app works wonderfully. I used it not only as a standard metronome, but also to help myself learn three against four rhythms as well as master the syncopation in a Gershwin piece I'm learning, using the different time signatures and the different levels of accent. The ability to select exactly which beats to accent (and/or be silent) as well the different note values is invaluable to me, and has really helped me overcome my difficulties with rhythm. The interface is easy to work with, and I love the feature which allows you to tap out the desired tempo. Everything needed is right at your fingertips; it is not hard at all to make any sort of adjustment to the settings, major or minor. (Also, fiddling with the background colors is fun!) This app is the best metronome I have ever used, and I would definitely recommend it. Love this app. I have it on an iPhone 6s, an iPad (2017 not sure of the number) and an Apple Watch series 2. I found that adjusting to the latest iPhone version took a little bit, there are some things that worked fine and now are simply different. I would love to see the app work with the haptics on the Apple Watch optionally. That would take Tempo to the next level. I love this metronome. I use it all of the time. I use it for conducting my orchestras and in my personal practice. Bravo!!! Keeps time, easy to program. Easy to see. Good work. Works good.